Jamie Lee Curtis is the author of twelve best-selling children's books that address core childhood subjects and life lessons in a playful, accessible way. Jamie finds the inspiration for her writing all around her—in the experiences of her children, her godchildren, her friends—and of course in her own life. Her first book, When I Was Little, was sparked by her then-four-year-old daughter's boast that she was no longer “little.” Tell Me Again About the Night I Was Born, a celebration of adoption and the start of a new family, was inspired by the adoption of her own children. And as an author, of course Jamie loves big words and knows that words have power. Her latest book, Big Words for Little People, gives young children the knowledge and power of their own “big words.” All of Jamie's best-selling picture books are illustrated by Laura Cornell: Big Words for Little People; Is There Really A Human Race? ; It's Hard To Be Five: Learning How To Work My Control Panel; I'm Gonna Like Me: Letting Off A Little Self Esteem; Where Do Balloons Go? 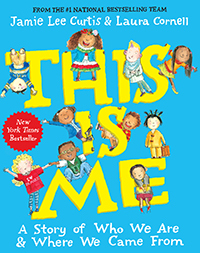 An Uplifting Mystery; Today I Feel Silly and Other Moods That Make My Day; Tell Me Again About The Night I Was Born; When I Was Little: A Four-Year-Old's Memoir of Her Youth; and This Is Me. Jamie is also well known as a film actress, with starring roles in such acclaimed films as Beverly Hills Chihuahua, Freaky Friday, True Lies, Trading Places and A Fish Called Wanda. Jamie is the mother of Annie and Thomas and is married to actor/director Christopher Guest. They live in California. From the #1 New York Times bestselling creative team of Jamie Lee Curtis and Laura Cornell comes a timely picture book about immigration. Raising important identity issues like “Where did we come from?” and “Who are we?” This Is Me is as delightful as it is important, sure to stimulate dinner table conversation. Learning not to hit? Having to wait your turn? Sitting still? It's definitely hard to be five. 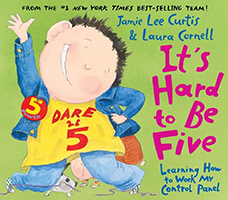 But Jamie Lee Curtis's encouraging text and Laura Cornell's playful illustrations make the struggles of self-control a little bit easier and a lot more fun!